Made with beef, barley, and other colorful ingredients (onions, garlic scapes, carrots, and scrambled eggs). Garlic was used in various forms (garlic paste, garlic powder, fried garlic) in order to ensure that the flavor and umami of the garlic have thoroughly infused both the rice and the other ingredients. Simply cook in a frying pan or in the microwave and enjoy. The garlic and the atmosphere created by the yakiniku (Japanese-style grilled meat) in this dish serve to stimulate the appetite, as well as to give you energy! Garlic was used in various forms (garlic paste, garlic powder, and fried garlic) for different stages of the preparation to ensure that the flavor and umami of the garlic have thoroughly infused both the rice and the other ingredients. 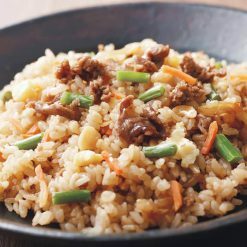 This dish includes beef, barley, and other colorful ingredients (onions, garlic scapes, carrots, scrambled eggs), giving it a fully populated feeling (contains about 7% beef, about 6% barley, and about 9.5% colorful ingredients). The rice and seasoned broth were cooked together in a kettle over an open fire (using a specialized recipe), allowing the umami to soak into each individual grain of rice. To cook using a frying pan, add oil to the pan, heat well, then add the yakiniku garlic rice (still frozen). Cook on medium heat for 3 to 4 minutes.To cook using a microwave, place the yakiniku garlic rice (still frozen) on a flat plate, cover with plastic wrap, and microwave approximately as follows. Microwave 225g (one serving) of the dish for about 4 minutes in a 500W microwave, and for about 3 minutes 30 seconds in a 600W microwave. This product contains polished rice (domestic), vegetables [onions (domestic), garlic scapes (China), carrots (domestic)], beef (Australia), barley (domestic), soy sauce, yakiniku tare sauce [soy sauce, sweeteners (sugar, starch syrup), apples, rice wine for cooking, table salt, garlic paste, sake lees, onions, sesame oil, sesame, chili pepper, caramel color], scrambled eggs, sugar, cooking wine, fried garlic, palm oil, table salt, gochujang, lard, yeast extract, spices (garlic powder, ginger, chili pepper), fruit chutney (mango, pineapple, papaya, banana), butter.. 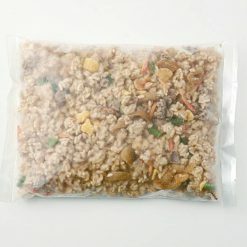 This product is not suitable for anyone with allergies to egg, milk, wheat, beef, soy, pork, apple, banana or sesame. Origin of ingredients: rice (domestic), beef (Australia). Prepared and packaged in Japan.